Last year, I was crazy enough to make a different Christmas card for everyone I sent one to. This year, I decided that there was no way I could do that while keeping up with making things for Etsy and working on some custom orders that I received from the two craft shows I’ve done. One of the women I follow on YouTube was been making card videos with the Cricut cartridge Create a Critter 2. I have the original one and wasn’t sure that I wanted to get the second one because it looked like a lot of the same critters. But oh how I was wrong! I love the second one much more than the first. 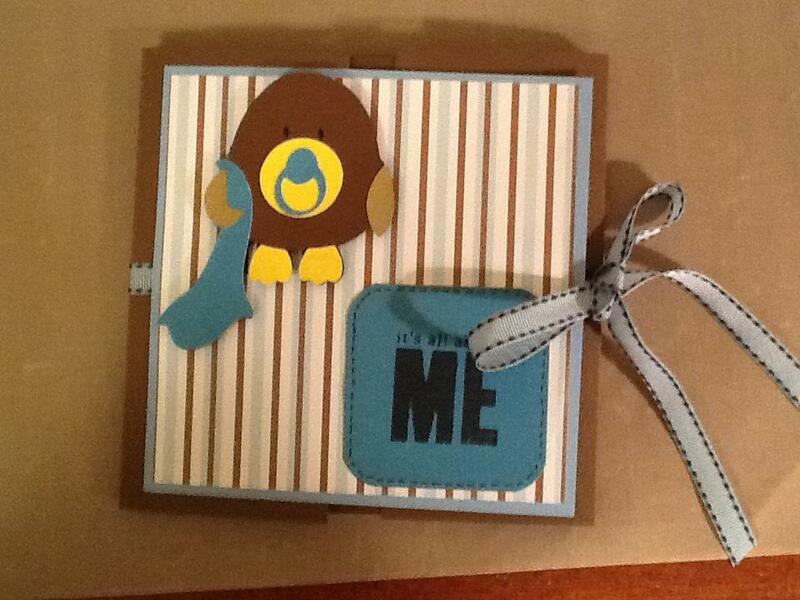 The first was my go to when I made kid pages or cards because of the cuteness of the animals on there. With the second version, the animals are dressed up for any occasion you can think of – there’s Valentines, Halloween, Easter, Christmas, Hanukkah and birthdays just to name a few. And it’s not just one animals. For example, Christmas features an elf monkey, a reindeer, a mouse with a Santa hat, a dog with a Santa hat, a snowman, Ginger bread man, ginger bread house – I’m sure that there are other images that I forgot. If you make lots of cards for specific holidays or make them for kids, I’d really recommend this cartridge, even if you already have the first one! The images that I chose to make for my cards (so far) are the mouse with the Santa hat and scarf, the dog with the Santa hat and scarf and the Reindeer. I cut them all at 3 1/2″ and then assembled them. They looked a little plain to me so for the reindeer, I used red glitter glue and made the nose sparkle. On the hats for both the mice and the dog, I used clear glitter glue on the white parts. The only cards that I have assembled completely so far are the reindeer. I used a couple of Christmas paper packs that I bought at AC Moore and Hobby Lobby that were 6×6. I cut the pages in half and then again at 4 3/4″ and used distress ink around the edges (either barn door or peeled paint). I glued that to a piece of red card stock that was cut at 3 3/4″ x 5 1/4″. The images were then placed on pop dots and attached to the card. I am not sure how I am going to assemble the remaining cards since I did manage to pick up a 12×12 Christmas paper pack at Michael’s the other day. (They were $19.99, then 50% off and then an additional 30% off of that with the Black Friday early morning coupon! I should have picked up 2!!) I like the way the reindeer look, but I think I want to make the others a little different. I am also trying to keep in mind the weight of the card since I am going to be mailing most of these and I don’t want to have to use more than one stamp. Is anyone else out there making their own Christmas cards this year? I’d love to see what you’ve made! Posted in card making, Cricut, distress ink, ideas, YouTube and tagged 12x12 Christmas paper pack, 6x6 Christmas paper pack, ac moore, Christmas, Christmas cards, Christmas images on Create a Critter 2, Christmas paper, Create a Critter 2, Cricut, Cricut cartridge, dogs, glitter glue, Hobby Lobby, mice, Michaels, pop dots, red cardstock, reindeer, Santa, Santa hats, YouTube. Bookmark the permalink. Snapfish is doing their 300 Penny Prints again. I ordered them last time and it cost less than $20 (with shipping – that’s how they get you!!) to print 300 pictures. The next closest I’ve ever seen is 50% off prints or $.10 each prints at Walgreens. Snapfish is clearly still the better deal, unless you need them within the hour. The promo code for this deal is MPENNY300 and ends 11/26. Speaking of Walgreens, they are offering a free 8×10 print until the end of today. You don’t have to make any other purchase either! It’s a great deal since I think the 8×10 enlargements are a couple of bucks. The code for that is FREE2THANK. They are also offering 50% off everything photo related (prints, books, cards, etc). Don’t know what to get someone for the holiday? Tired of the same old gift card to their favorite restaurant? How about an iTunes gift card? Well, from now until some time in December (or until they run out the website says), if you purchase a $25 gift card at Michael’s, you will only pay $20!! Of course, I know somewhere that you can get really cute gift card holders for these…… (Had to self promote! 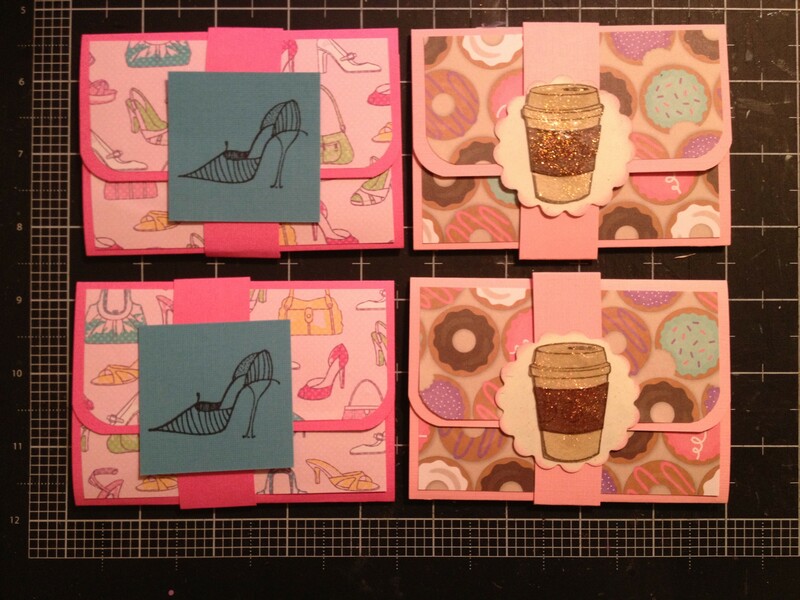 https://www.etsy.com/listing/114763902/set-of-4-pop-up-gift-card-holders-for). Have you ever heard of the app GeoQpons? It’s a free app that shows you all kinds of deals. You can search by name of store or by item and all kinds of deals come up. It’s the equivalent of keeping that Clippers Coupon (for those of you in South Jersey) or those ValuPak coupons on you at all times. You can see what stores are around you and what kind of deals they are offering. And it’s not just retail stores – there are restaurants, auto body shops and even car rental deals on there! These are just some of the great deals that I have found recently and thought I would share with you. Pass them on to your friends and family. Budgets are tight and we all could use some deals! Enjoy the start of the shopping season! Posted in deals and tagged apps, coupons, deals, Etsy, GeoQpons, gift card holders, gift cards, gift ideas, holiday deals, holiday shopping, iTunes, Michaels, photo printing, Snapfish, Walgreens. Bookmark the permalink. In those two months, they had a lot of gifts to open and put away. So, I decided to wait until after the wedding to give them their housewarming present and make it into a larger gift. I went to Target and went through their registry and found a bunch of bath items that hadn’t been bought, as well as some kitchen things. Then I went to AC Moore and bought a large basket to house all the stuff I just purchased. I also picked up a roll of clear cellophane wrap. 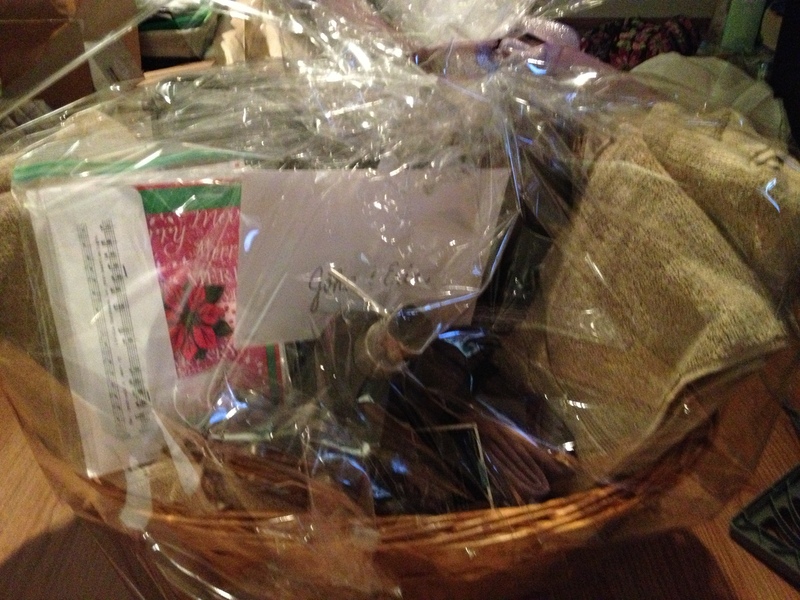 In the second picture, there is also a set of Christmas cards that says Merry Christmas Love Mr and Mrs (last name). They feature a red poinsettia on pop dots sitting on a “Merry Christmas” background stamp that was done with Stazon Blazing Red ink. The envelope was stamped with a long music notes stamp I have. Here are some pictures of the cards that I made for them. 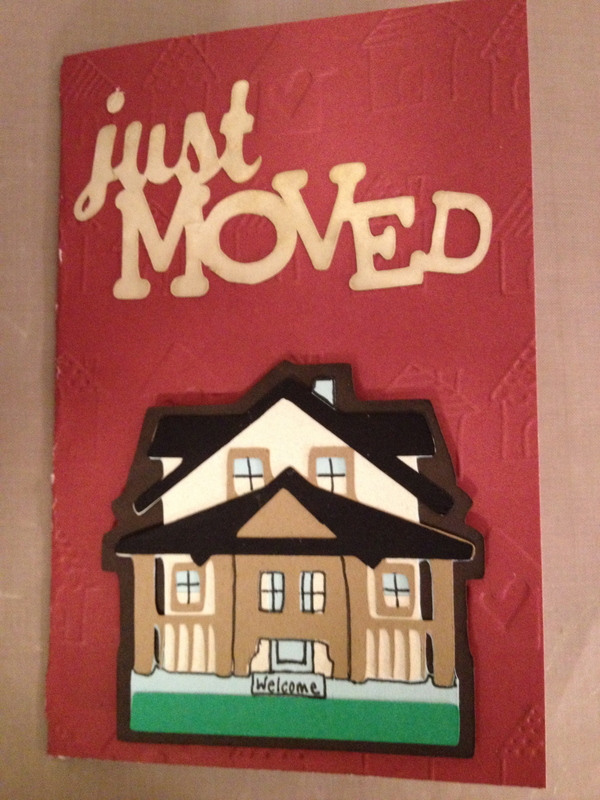 For the “Just Moved” and the house, I used the Just Because cards Cricut cartridge. I added the green strip to look like grass and wrote “Welcome” on what looks like it should be the mat. I cut the “Just Moved” out of white card stock and then inked it with Tea Dye distress ink. The card base is also cut from the same cartridge, as was the envelope. Hope you like them. Thanks for stopping by! As always, feel free to leave a comment. Posted in card making, Cricut, distress ink, ideas, stamps and tagged ac moore, bath, Blazing Red Stazon ink, Christmas cards, Elegant edges, housewarming card, housewarming gift, Just Because Cricut cartridge, Just moved, kitchen, purple colorbox chalk ink, Target, Tea Dye distress ink, wedding card, wedding couple stamp, wedding gift. Bookmark the permalink. I feel like lately I have been playing catch up. My day job has been crazy, so I haven’t had as much time to work on projects as I would like. I had an amazing client ask for a custom order at the craft fair that took me awhile to work on. I loved the idea that she proposed so much that I actually did the same thing for my brother and sister-in-law for part of their wedding present! 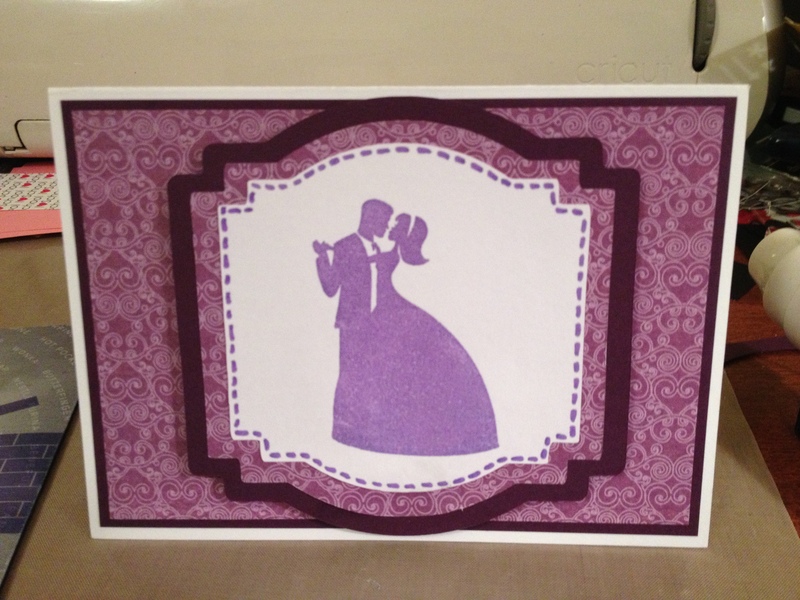 For the custom order, I was asked to make one wedding card and eight Christmas cards from the couple. 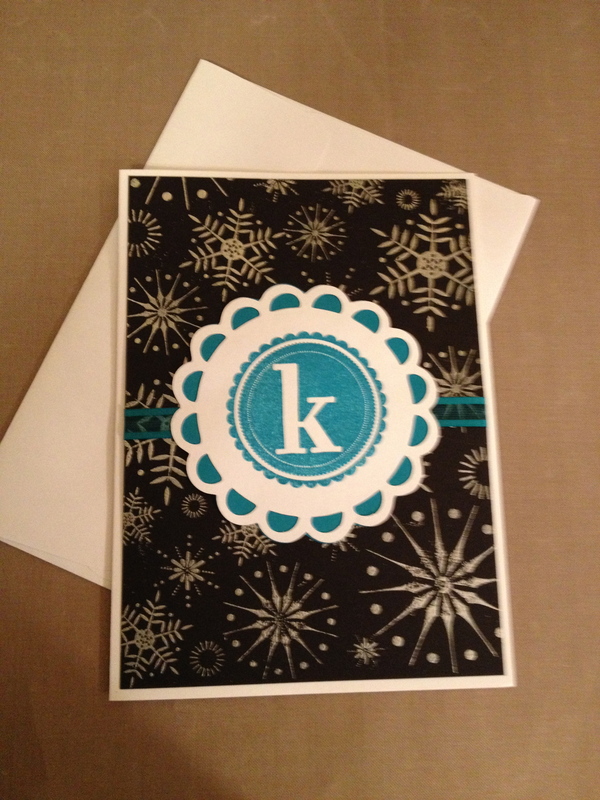 She wanted teal, white and silver as the colors incorporated into both cards. For the wedding one, she wanted starfish and sand dollars along with the colors. It took me awhile to come up with the concept for the wedding card – the Christmas one was easy! For the eight Christmas cards, I took a white card base and cut a black sheet of card stock to fit over the front, with a small border of the white showing around the edges. I then used a snowflake background stamp inked up with VersaMark and silver embossing powder to create the front piece of the card. Using the Cricut cartridge Elegant Edges, I chose one of the circles with a scalloped edge and cut the top layer in white and the bottom layer in teal. 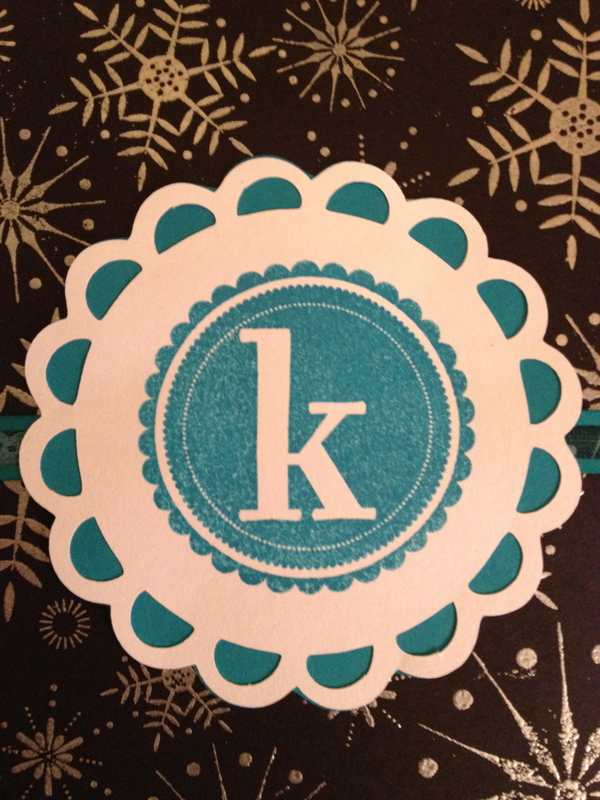 Then I took a monogram stamp that I got from the AC Moore dollar bin and inked it up with teal Stazon ink and placed the “k” monogram in the center. I had some teal see-through ribbon that I thought would look great behind the monogram. I glued all the layers together and then onto the front of the card base. 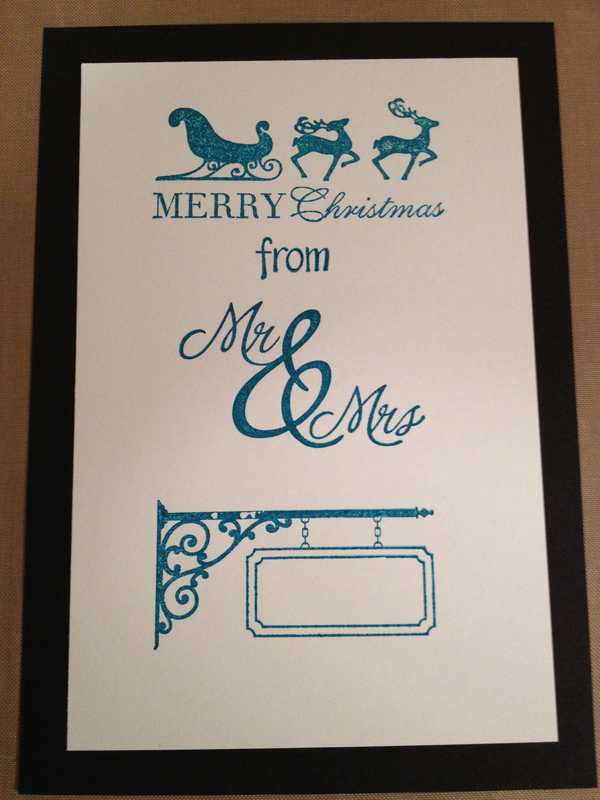 For the interior, the customer wanted it to say “Merry Christmas from Mr and Mrs. (last name)”. Since I don’t really like printing sentiments from the computer, I had to find stamps that had the correct saying and were size appropriate. The first one I chose was a sled and two reindeer that said Merry Christmas underneath it. Then from a word stamp set that I got at Hobby Lobby I took the word “from”. The Mr and Mrs also came from a stamp I picked up at Hobby Lobby, but this one was a wood mounted stamp. (The other one was a clear stamp.) The last stamp I chose was a sign stamp where I could print their last name. I inked up all these stamps with the same teal Stazon ink I used on the front and stamped them onto a piece of white card stock. I backed that with a piece of black card stock that was a little larger and then placed them onto the inside of the card. The wedding card was another story. It took me so long to come up with a concept I wasn’t sure I would get it done in time! I knew that I had sand dollars and starfish on the Life’s a Beach Cricut cartridge. I also bought a stamp set when my sister got married on the beach that featured beachy items. I just couldn’t get a background image together. I went through all my paper (which is A LOT!!) and came across this beach scene – sand, palm trees, beautiful blue sky with clods and the water. I knew I had a stamp of a couple dancing, so it was coming together. What if they were dancing on the beach with some sand dollars and starfish around them, with the beautiful sky and ocean in the background? 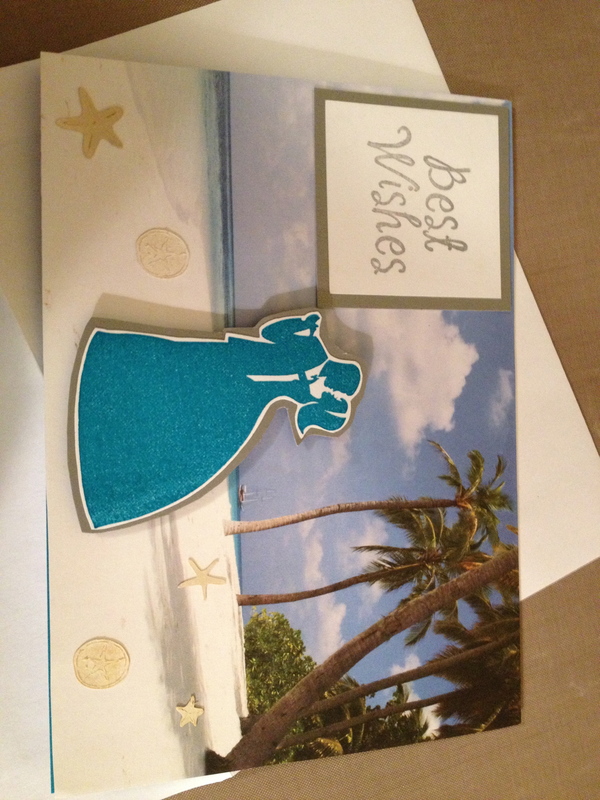 I cut the paper so that it was mostly the beach and then adhered it to the front of the white card base, with no border. 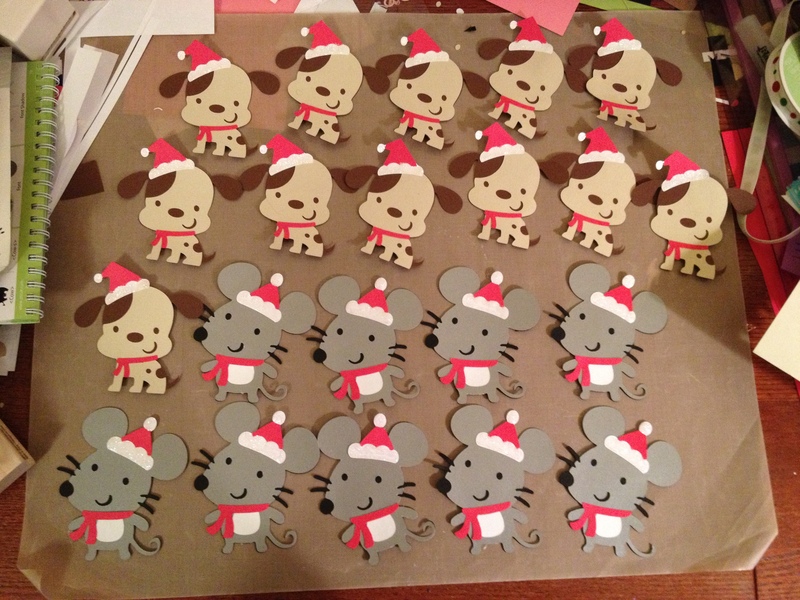 Then, I cut out the pieces from the Cricut and I believe they were 3/4″ or 1″ at the most from white card stock. I inked them up with tea dye distress ink so that they wouldn’t stand out on the beach as much. Next, used the same teal Stazon ink and stamped the image of the couple dancing onto white card stock. I did some fussy cutting and then attached it to some silver paper. I also stamped “Best Wishes” onto a piece of white card stock with silver ink and then attached it to some silver paper as well. I adhered the sand dollars, starfish and sentiment right to the card base, but for the couple, I used pop dots so that they would stand out. 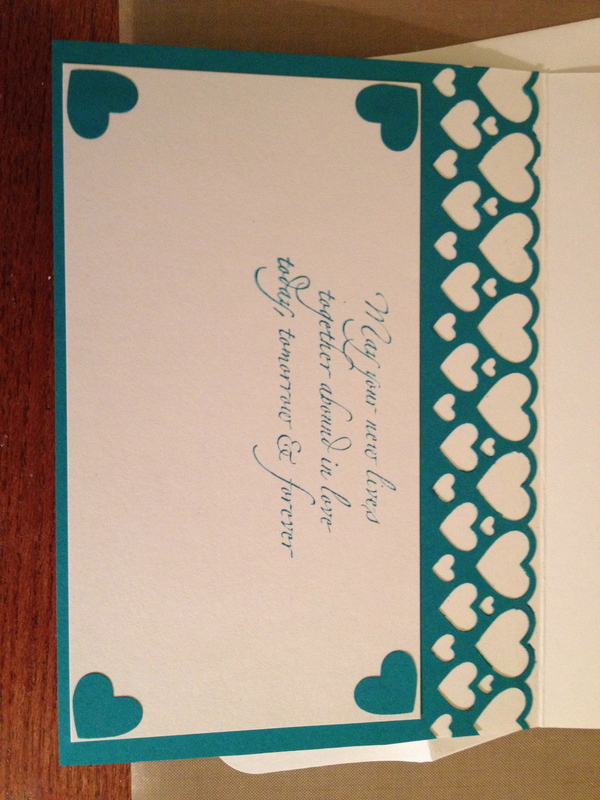 For the inside, I used some teal paper and a Martha Stewart deep edge border punch with hearts. 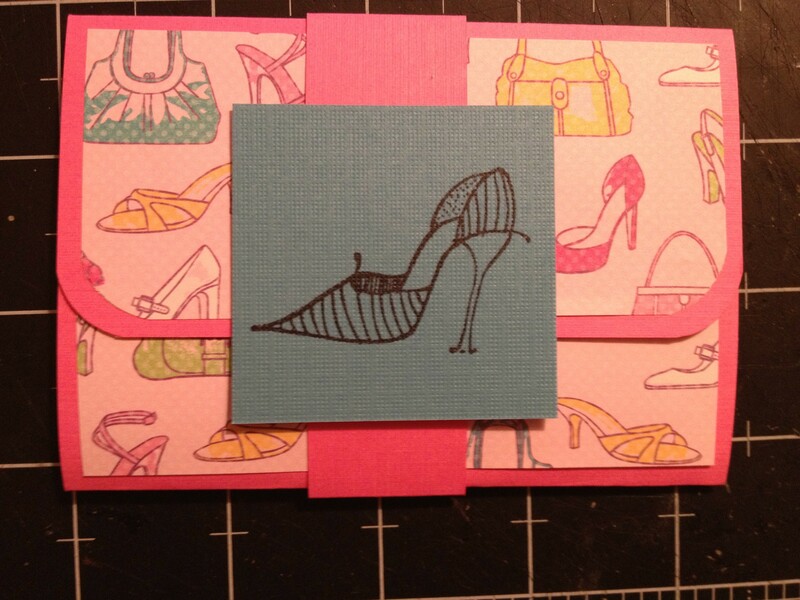 The teal paper covered the interior of the card and then I placed a piece of white card stock right underneath of it. On that, I used a stamp that said “May your new lives together abound in love today, tomorrow and forever”. I used some of the hearts that were left over from the top cut out to adorn the corners of the white paper and I was done! Here are some pictures of the custom order! Thanks for stopping by! As always, feel free to leave comments or questions. Posted in card making, Cricut, distress ink, ideas, stamps, starting a project, VersaMark and tagged ac moore, cardstock, Christmas card, couple dancing stamp, embossing powder, Martha Stewart deep edge punch, monogram, Mr and Mrs, ocean, sand dollars, silver, snowflake, snowflake background stamp, star fish, Stazon ink, teal, wedding card. Bookmark the permalink. Are you not sure what to get someone for the holidays? Considering that it is still awhile away (five weeks and 3 days to be exact! ), you may not have thought about it yet. Well, I wanted to give you guys a sneak peek at what I have been working on before I put it up in my Etsy shop. It’s crazy that I have to think about Christmas already, with Halloween just passing and Thanksgiving not here yet. But, the earlier I start, the more I can make and more custom orders I can take! One of the many interior pages. Others feature pockets that hold photo mats or journaling tags! I have done a gender neutral baby book and a Christmas one, which I will be adding to Etsy! For a lot of people, sometimes it’s just easier to get the person a gift card. After all, a gift card always fits, right? But giving a gift card can be boring. Well, what if it wasn’t? 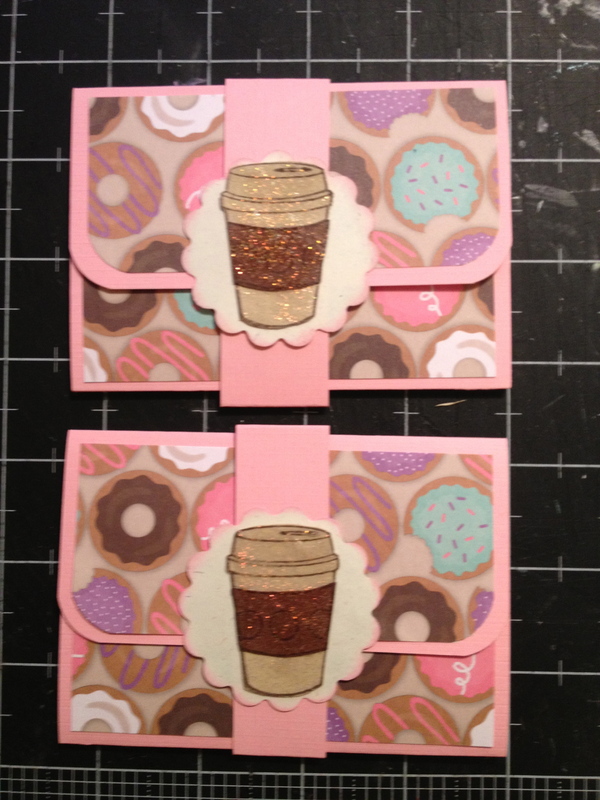 I have made pop-up gift card holders! You place the gift card in the middle slot and close it up with the belly band. 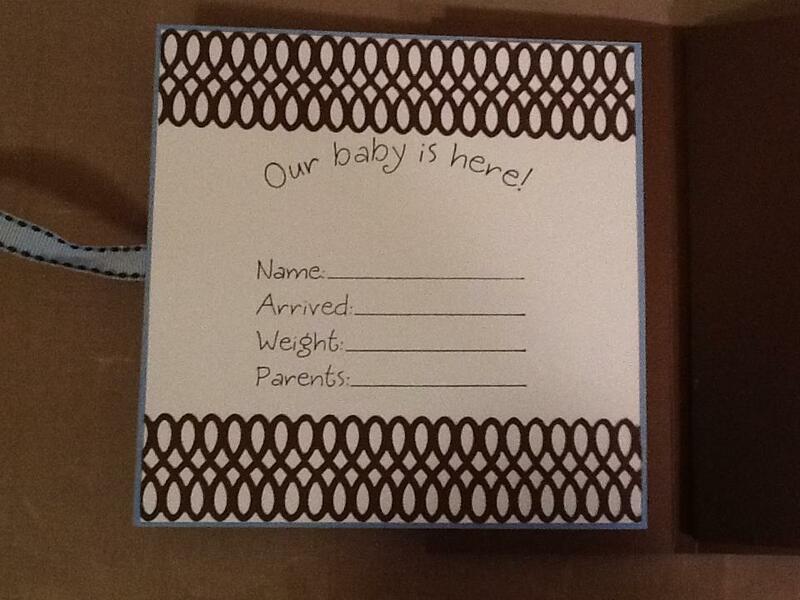 When the recipient goes to take the belly band off and open the holder, the card pops up! These are the perfect addition to a gift for someone’s birthday, Christmas, Hanukkah, baby showers, wedding presents or any other occasion. It’s also great to dress up a gift card for a teacher, coach, bus driver or a co-worker. The ones that I am showing here are ones that I made for my mom for her co-workers. For the coffee and donuts ones, she gave them a Dunkin Donuts gift card and for the shoes and purses one she gave them Kohl’s gift cards. They can be designed to go with any theme of gift card or event in mind. For example, I have one that is made from all football paper for a coach or I have one that features trucks being driven by animals for a little boy’s birthday. Hopefully I will be putting these items up on Etsy this weekend. However, if they’re not there and you are interested in some, contact me and I will add a listing for you! Thanks for checking out the sneak peek of new items that will be featured in my Etsy store. The address is http://www.etsy.com/shop/scrapsecrets if you want to go check it out. Posted in Cricut, distress ink, ideas and tagged Baby books, birthday presents, Christmas ideas, Christmas presents, co-worker gifts, Etsy shop, gift card, gift card holders, gift ideas, gifts for coaches, gifts for teachers, holiday presents, photo mats, shower gifts, wedding gifts. Bookmark the permalink.